...or maybe it should be "pulling through." That was one BAD week, but after a Z-pack and several days of Advair, Albuterol, Tessalon pearls and various OTC remedies, I am finally back at the easel. 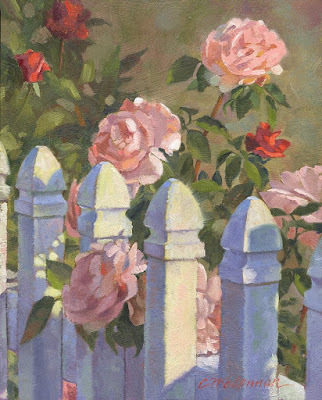 I started this second "picket fence" challenge painting before going down. Love those pale peach roses. Pleased to know you are back at your easel Connie...hope you feel recovered after your illness. Lovely paintings. Thanks, Anne. :-) Yep, back in the saddle.